CoolSculpting freezes your unwanted fat cells in the desired areas of your body. The science behind it is based on years of research that has proven that fat cells are highly affected by cold temperatures and are addressed without surgery. Following your procedure, the cooled fat cells begin a process called “apoptosis” and will begin to shrink. These results can be achieved with a device which non-surgically treats the fat cells without harming your skin layers covering the fat. This is because the basic properties of water and fat which makes the freezing temperatures very different. Since skin is over 60% water and fat does not consist of much water at all. Dr. Gorin and his team will apply below-freezing plates to the skin that are not cold enough to freeze the skin, but cool enough to “freeze” the fat cells. 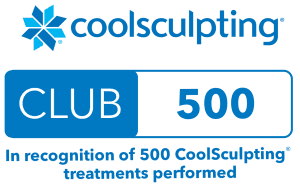 Gorin Plastic Surgery & Medspa is proud to be part of the Coolsculpting Club 500! This means at our MedSpa we’ve treated over 500 patients (and counting!) with the procedure. During the time following the treatment, some patients see results as early as three weeks. The most dramatic results are typically seen during that two to four month period following the procedure as fat cells in treated areas die off. These fat cells are naturally processed by the body, so they will not migrate to other areas. Sixteen weeks after their first treatment, many patients opt to have a second treatment, making results even more noticeable. Even with these incredible results, the procedure requires no surgery, no anesthesia, no needles, and no down-time. This the only FDA approved, non-surgical technology to freeze away body fat. Even with diet and exercise some fat cells refuse to die. With this non-invasive procedure, it can take care of problem areas that cannot be solved through surgery or diet and exercise. One such problem area that patients find that this the perfect remedy for is the dreaded double chin. Double chins cannot be hidden, but with this technology, they can finally be addressed! When women suffer from persistent, stubborn fat on their hips, stomach, back, love handles, legs, arms, and isolated areas all over their body. CoolSculpting involves no needles, no special diets or exercise, no surgery and no downtime, and since the procedure is non-invasive, recovery time is fast. While losing or gaining weight generally does not increase or decrease the number of fat cells, it simply changes the size of fat cells. The layer of fat that covers your muscles will be treated by Dr. Gorin and his team using this technology, treats your fat cells in your problem areas of concern. This revolutionary procedure targets and cools unwanted fat cells in your targeted areas, which is then naturally processed by your body. Contact us for more information or to schedule a complimentary consultation at Gorin Plastic Surgery & Medspa today! In many cases, just one procedure may be enough to meet her goal of losing fat cells. However, additional procedures produce even more pronounced results and are therefore more desirable for many. On average, each procedure results in a noticeable reduction of fat in the area that has been treated, and patients can start to see results in as soon as three weeks following treatment. For most patients, they will notice visible results over a period of two to four months. I am interested; Now What? It’s easy to get started on your CoolSculpting journey to a slimmer, sleeker you. Your first step is to schedule your complimentary consultation with Dr. Gorin, board certified plastic surgeon. You will meet one-on-one with someone on our Gorin Medspa team who has received specialized training in this treatment. Our professionals will take the time to discuss a holistic approach to meet your goals for reshaping your body. Together, we will take your whole body into consideration and then focus on specific areas of your body such as your legs, arms, stomach, love handles, back and bra bulge, muffin top, and/or your double chin. For some people this individualized, customized treatment plan may include more than one CoolSculpting treatment. For example, you may want freeze fat from your inner and/or outer thighs and also treat your double chin which can be done in one procedure. At Gorin Plastic Surgery and Medspa, we will work with you to decide how many procedures will be necessary to make your body look and feel the way you want! Because everyone’s body is unique your results may vary.